I usually try to buy pro chain, still needs sharpening often, but cuts faster and works better, howsoever, use caution, does not have those anti-kickback links. Here we are looking at some the differences but for the most part the similarities of the iconic Stihl ms460 and it's successor, the ms461. I perused through the IPLs for the 046, 460, and 461 and noticed that a lot of same numbers for the respective parts and one or just a few digits being different for a lot of the other parts. We did touch on a few of both types in this video. I did not really notice any "glitches" in my thoughts this time. if you are interested in port work of some custom saw modifications, please shoot me an email. What do I think about this modification? My saw was unregulated and didn't have full power. Spring washers must be used in all screw. For certainty you must use a counter nut to fix the blade. I am loving my 16" 60V Dewalt chainsaw that I got a month or so ago. It seems to me to cut as fast as any other gas fed saw, I don't have to run and get mixed fresh fuel and it starts and stops with the pull or release of the trigger. It works very silently and is always ready. I used it to cut an approx 20 inch tree so I got assorted cuts along with 24 cuts through the trunk on one battery. As a downside on the kit Dewalt includes its very cheapest 20V charger meaning recharges take up a lot of time necessitating downtime without extra batteries. Luckily I have the 60V fast charger that came with the circular saw along with extra batteries. For someone like me that needs a saw for off and on needs as a landlord that actively takes care of their properties its perfect so far. I gave my gas poulan away to a landscaper because I wont need it anymore. Just rambling brain static...another attempt to lay out the concept of product designs being influenced by the design tools. A derivative being its not unusual to see design folks mole into a cyber bubble when doing complex designs. Squirrel! Wanted to Build "Ultimate Old Man Saw", Got Pushed Aside...Case Assembly MS660..Again! Chain saw spare parts , cylinder for $ 35 !!! DEWALT has been trickling outdoor power tools into their 20-volt line over the last year or so. They currently have a 20-volt string trimmer, blower, hedge trimmer and have now added the new DCCS620 12" Compact Brushless Chainsaw. The new 12" Chainsaw has many of the other features you find on the larger 40-volt or FlexVolt chainsaws, such as tool-free chain tensioning, brushless motors, fixed-rate automatic chain oilers and an Oregon bar and chain. One item that it is missing is a variable speed trigger. The 20-volt model has a single speed trigger that allows the chain to run at 25.2 feet per second when the trigger is pulled. So let's get right to the question that is on everyone's mind. Can DEWALT's 20-volt max battery properly power a chainsaw? The answer is a surprising YES, it can power it and the battery and brushless motor combination do quite well at it. This top handle compact chainsaw is not going to be a go-to saw for felling trees, but it will do well at limbing, trimming and also cutting dry lumber on the jobsite. The saw was surprisingly resilient through our test cutting up a pine tree we dropped a few days before and we did not have any thermal timeouts or overloads. For a saw of this size and voltage, it really did well. When you look at all the battery operated chainsaws from DEWALT, you will see some items that look the same. The chain tensioner is most likely a shared item between all three of their battery saws on the market. One would also think that the chain oil fill cap would be also, but that item on this saw feels a bit weak. We will say that the cap flexes less once there is oil lubricating its movement, but either way, the cap gives the saw a feeling that one should take care in adjusting it. Other than the cap, the feeling of the saw is pretty good. One would wish they would have carried over the variable speed trigger, but the motor used might not have the torque to run at lower RPMs. 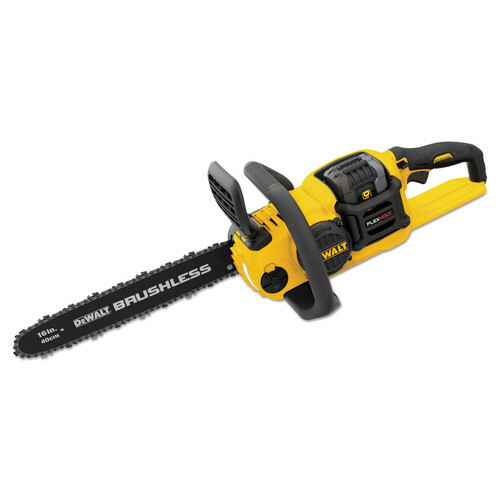 Any way that you look at this saw, it is a perfect match for a homeowner who wants to be able to trim trees and possibly clean up a mess after a storm. Hunters would love the saw for cleaning out areas in the woods! Contractors who deal with pole structures might enjoy it for trimming 4x4's or other rough cut items. This saw does have a large group that will enjoy using the saw! Vlog type video, just to do something as I've not done any videos in awhile. Dan shares his recent story of an injury caused by a Silky saw and how he will approach things in the future. Couple of friends hanging out at the farm. Spike60, Motomedic, Ron A, J. Walker, And myself. Just trailing along throughout my day. Felt amazing to be able to walk again. A bit tender, and muscles aren't even close to where they need to be, but it'll come. First test drive(s) on a new Stihl ms291 (clamshell design cylinder, coming out of Northern Cali)) with the insane-o zipkit and some combustion chamber work versus a gently used Husqvarna 346xp (hails from Tennessee) also with the insane-o zipkit and some combustion work as well. Both were test run using a Tsumara 24" bar and .325 chain. I thought it was a good comparison since the Stihl has quite a bit more displacement but is more of a smog design engine. Turns out the timed runs were pretty much the exact same. I am currently available for port work. If you are interested shoot me an email and we can start the process. I got a contact from a Craiglist customer, guy wanted his 24 inch split firewood cut in half. So I picked up a couple saws at my brothers a Johnsered 670 and Stihl 24; I ended up using the Johnsered, the power made the difference. $50 to cut a bunch of logs in half, the time driving up twice and back made it kind of a service exercise. I told the guy to paypal me which he did not want to do. In this day and age that should be super easy. Shot in the spring as the bark is beginning to swell so we are having to clean out the cut continually. This is the first test drive on an insane-o-ized Husqvarna 562 fresh out of the shop sporting a 32" Oregon liteweight bar and hogging the wood. Doesn't seem to have any problems pulling this length of chain on a fatty red. I'm currently available for port work. If you are interested please shoot me an email. Crankcase splitter mod / fix. Huztl splitter broke, sorta. Ok, got this splitter from Huztl back when there was a sale at around $35. I've split a dozen or so chassis with it. Recently the handle got very very difficult to turn, even with a pipe extension. I think the threaded part is bent. UGH. I backed off the threaded part and BROKE the tip in the process. Don't do that! need a 1.5mm allen for the set screw. TINY screw. then you can pull the tip out. . ... THEN pull the threaded rod out. So, long story short the rod was unlikely to thread back in. Get out the tap and tie set. Nogo. I used a 1/2" drillbit to ream out the splitter. (drillbit is too small) ...tap to 5/8" UNC. Then I couldn't get the threaded rod in there. Needed my reamer set to .525" to then get the 5/8" rod in. So, pays to have the right size drill bit for the tap in the first place. But I digress. This is easily done at home with a vice, 5/8" tap and proper drillbit. Then you need a short piece of 5/8" threaded rod. I have a nut welded to the rod, but you could just as easily use two nuts on the end, and then you can hit it with the impact! yey! now it'll be stronger and easier to split crankcases! Crankcase splitter mod / fix. Huztl splitter broke, sorta PART 2 ..it works! I have written that I have a Stihl MS361 and it has usually served me well. Usually. But there were times when I wanted to cut and it would not start. Recently I ran out of time and ideas and took it to the chainsaw place for repair. I had already replaced the magneto and carb. If I remember right, they found a broken ring, a stuck ring, and a problem with the unloading button. They cleaned the piston with ultrasonic and I told them I did not care about the unloading button and they could replace it with a plug. It ran great! A good running saw with a sharp chain is "almost" fun to use, when the chips hit my pants so hard and fast I can feel them. Today, my saw ran out of power just as I expected it to run out of gas. So I turned it off before it ran completely dry. Later, I filled it up and tried to start it. No dice. I cleaned the spark plug with carb cleaner and scraped the contacts with a knife. Still no joy. Put in a new plug, no joy. Let it sit for a couple h ours, and it started up. Must have been flooded in the cylinder, I guess. But in just a couple minutes of cutting, it lost power and popped like a backfire three times. Huh?! I have never had it backfire before. So I am thinking I should think about a second chainsaw as a backup for times when I need... no make that NEED! to cut and my MS361 is balking. I am asking for recommendations from our esteemed members. I am looking for reliability and value. My 24 inch bar and 84 link chain handle everything, and I would like to stay with that. Please do NOT point to videos. I value your opinions and experiences. A high-bandwidth video is a waste of time and bandwidth. Thanks. Cover quickly bottom end, Handle, and Top end. Muffler too. Run through really fast...didn't dwell on things. Matt's "Bolt by Bolt" is more complete in the details. But I cover some points that increase the chance of success...and a few notable changes to the part quality in these Farmertec AM parts that comprise this saw. Worth a listen if you plan to build one, or update and existing AM MS660. Sorry yet again for a lousy camera angle....also had a brain freeze on part names for chain brake detent and linkage...it was in the sub 20 degree range in the garage! Winter has arrived!. Just no way to re do that amount of video time..so I had to go with it. Sorry .. I probably won't build another for a while. Plan to test and tune. WIll discuss part improvements in that video more when I'm not in a rush. Also will discuss the Cross Performance issue. I think I understand why two saws builds with that top end failed....I had blamed it on cranks. Don't think it was. Not a happy camper here as this has cost me a lot of time. If you need something to saw 24", stay with the same size or switch to the MS290 Farm Boss. I usually run a 20" bar 81 link bar on mine and am able to cut whatever I need, but I also have a 28" 91 link bar for it for when the need demands. I've two smaller saws, both MS180s, one is quite old has been repaired a couple times, still my main saw for up a certain size log. I use it and the newer one mostly for cutting brush and firewood. Like I said, up to a certain size log, then I'll haul out the MS290. I have three other saws, but only two are working and neither one of those are all that great. Sorry I missed your post here - I do not watch many youtube videos on forums. I want to watch those, I go on the youtube and do a search for what I'm looking up. On my slower connection, those really slow up load time on a forum page.